Calculate roughly 15-20 minutes of walking time from Bosvoorde station, tram stop or parking area to the Birchwood Circle. On the day the routes will be indicated clearly. Three years ago, we were struck by the terror attacks in Brussels. Hate and terror, so close by, a shockwave went through the country. Since then, We have the choice has been inviting people to commune together in a circle, to listen to each other, heart to heart, despite and irrespective of differences between them, because every day we have the opportunity to make the choice for love above fear. We welcome everybody and anybody who would like to commemorate the 22nd of March, to a ritual of remembrance at the Birchwood Circle in the Zonïen Forest. 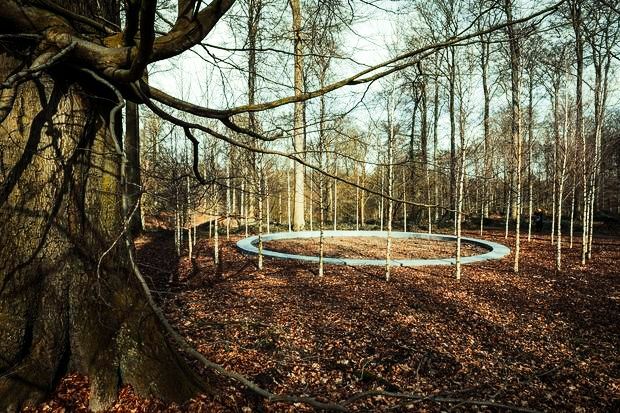 The Birchwood Circle is a beautiful monument amidst nature, created by landscape artist Bas Smets after being commissioned by Leefmilieu Brussel. It consists of an open space in the centre of the forest, surrounded by a round bench and 32 birchwood trees, as memorial to the 32 people who lost their lives and the numerous others who were injured on that fateful day. We will come together in a circle to share what we live and what we feel, each in his/her own language. Nobody is obliged to speak; being present is enough. We will reserve special places for those directly affected by the attacks (victims, close family and friends, intervention- and support services). Anybody can take part in the circle, standing up or sitting down. The circle experience will be enhanced by a musical item by the Framagomi choir. Whoever wants to, can, prior to the start of the circle ritual, participate in an hour of sitting in silence at the Brichwood Circle. This is an initiative of Silence for Peace. This is an initiative of Circles – We have the choice vzw/asbl in partnership with Leefmilieu Brussels, FOD, Kanselarij of the Prime Minister, MIVB, Silence for Peace, V-Europe and Life4Brussels.